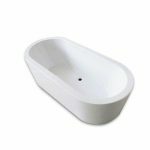 The PLAZIA’s classic shape makes it a versatile choice for traditional and contemporary bathrooms. Designed with comfort in mind it has a thicker rim and is supportive inside. Manufactured using the unique Acrymite® system to give a glossy, seamless finish. 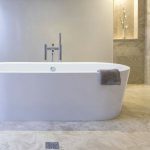 With the standard PLAZIA bath the waste pipe usually needs to be run under the floor. Please check the specification sheet for further options. Important: It is possible to fit an overflow filler to this bath.